Psycho: Don't think the Psycho is as bad as it first seems. The Psycho is the fastest unit to produce and to move. So if you're into rushing and you're in a rich map, producing 3 robot factories and pumping psychos out as fast as possible is quite a viable tactic wich you generally can't make work with toughs due to its high build time. Psychos are also great to capture flags and abandoned hardware, and when you need quantities to atract enemy infantry fire while your big and costly units (specially mortars, heavy tanks and mobiles) demolish everything. Beware though, that up to Patch 4 beta 2 the guard mode doesn't work properly for robots or tanks, so you'll have to keep the slow and fast units in different groups and move them carefully so to not let any of them unprotected. Another forgotten but great advantage of the psycho is their fast reload rate, which coupled with their speed can be used to surprise your opponent specially on cliffy terrain, where he'll get on attack range before being spotted. Producing some psychos mixed with your toughs (try 1 psycho for every 2-4 toughs) on large maps is always a good idea. Against toughs-only groups, never leave your psychos fire by themselves. Keep them selected, and once they start firing on the toughs (ie. on attack range), move them again to the middle of the toughs. The toughs will get out of minrange to attack and will be easy preys for the psychos. This will only work against small groups (read: credit-poor maps), 'coz against any units' big group or combo the psychos aren't very useful. Pyros: These guys definitely aren't what they first seem. Don't think about the Pyros as "slightly more expensive, slightly more efficient than psychos" or you'll learn the hard way. Actually, Pyros are somewhat specialized units, that excell in destroying structures, but that generally can't face other infantry (robots) by themselves in open ground due to their short range. I say open ground because once you put some pyros "around the corner", ie. out of your enemy sight but close to a cliff passage, or on the top of a LOS-blocking hill, for example, they'll pay for their cost on double. Pyros can't target air units, so remember to never send them by themselves to take territories. Ok, actually *never* leave them by themselves on open ground. Mixed with toughs or psychos and grouped for quick selection, you can use their high output damage to crack through enemy toughs and get to the "meat" of the attack group, ie. mortars and medium/heavy tanks. Another great use for the Pyros is keeping bridges destroyed. Don't be misguided by their initial low damage output, once the target is "on fire" the damage rapidly multiplies up to very high levels - something called ferocity by the Bitmaps. Last but not least, remember that even after a Pyros unit die, anything that it set on fire will keep burning and losing energy for some time. Ferocity doesn't seem to work well or at all against moving targets. Pyros make up for an excellent demolition squad when grouped into an APC, taking up most structures/factories in seconds.. try to use this on late games, or when you've already got the speed upgrade. 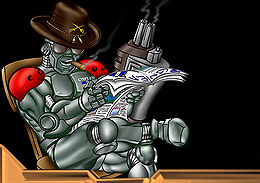 Toughs: The best all-round robot in the game, toughs should be the infantry of choice for any heavy army, but aren't the seven-headed beast most players consider them. Anyway, it's got good sight, good range, medium speed, high damage output, good armour, good reload. Yeah, it's got too many "goods" by their side, but it's got too important "bads": the tough has the highest minrange of all robots (minrange is the minimum distance they should be to attack a target) and they can't fire while moving, which's a characteristic for all robots. So what does it mean? Easy, on the tanks section you'll learn how to easily handle "tough swarms". Nevertheless, toughs are indispensable for any serious attack force due to their amazing AA (anti-aircraft) power, and they're so good that they make the psychos, pyros and laser really rare units on most games. After patch 4 beta2 the tough has been toned down both on sightdistance an attack range, greatly enhancing gameplay.